Chimpanzees may seem like a prized exotic pet. In fact, a few famous celebrities and common folk own chimps. And while they are extraordinarily intelligent and affectionate, as they grow, this intelligence can lead to boredom and destructive behavior. Really, let's face it—the idea of having a pet that so closely resembles a human is kind of peculiar. Plus, keeping any primate in your home raises controversy—as it's actually illegal in most states. Chimpanzees are only found in one small portion of Africa. In the wild, they live in close-knit family groups of up to 120 chimps, consisting of multiple males and females. They thrive in a social setting, eating together, sleeping, grooming each other, and playing. Young chimps nurse for the first five years of their life and are considered adults at the age of 13. As pets, chimps are active, strong, and extremely hands-on. Once they reach adulthood they can become quite physical and demanding, too, leaving many chimp owners unable to control their "teenager." If left with nothing to do, a chimp will quickly get bored and can cause serious damage to both your home and the people in it. However, their intelligence can be a draw to some pet owners, as they can be trained to communicate using American Sign Language (ASL). Chimps are at least twice as strong as humans, requiring a durable enclosure to keep them contained. (When you are unable to watch them, they cannot be trusted!) A room or large outdoor space with ropes, branches, swings, balls, and other play items is suitable. Glass windows should be protected by bars to prevent a strong chimp from shattering them. And a lock should be placed on the door of the enclosure to protect both your chimp and your neighbors. Chimpanzees are omnivores, meaning they eat both plants and animals. Fruit, leaves, insects, eggs, tree bark, nuts, and occasionally even small animals are all part of a wild chimpanzee's diet. In captivity, your pet's primary food source should be a formulated and nutritionally complete "monkey chow." But while these specialized primate diets offer much of what a chimpanzee needs, feeding them this way fails to encourage natural foraging behaviors—an important part of mental stimulation. Opening nuts, digging for insects, picking leaves off of branches, and biting into fruit and eggs are important to the well-being of a chimp and should be encouraged as a supplement to the primate diet. In general, your chimp should eat about 4 percent of its body weight in food daily. That means if your chimp weighs 100 pounds, it should eat about 4 pounds of food a day, though this amount can be adjusted to maintain an ideal body weight. Many chimp owners feed their primates people food, too—sometimes even pizza and buffalo wings. But while a chimpanzee will live and grow on a diet of fast food, spaghetti and Chinese takeout will not support a long and healthy life. Regular veterinary visits should be a part of your chimp's life. Heart disease, dental disease (chimps have 32 teeth), and diabetes are all common illnesses that pet chimpanzees are prone to. Your primate should be closely monitored for the aforementioned diseases, especially if you feed it a diet of human food. And vaccinations should also be discussed with your exotics vet. Educate yourself on what vaccinations are available for chimps as well as your chimp's exposure risk for a disease. In fact, vaccination campaigns are in place in Africa to protect wild chimp populations from life-threatening diseases like Ebola. But here in the U.S., since exposure is unlikely, such vaccinations may not be recommended. Is It Legal to Own a Chimpanzee? Even though they are quite endearing, chimps truly are wild animals, and it is illegal to own one in most states in the U.S. Still, you may be able to obtain a license in Oklahoma, Pennsylvania, Rhode Island, and North Dakota. And a few other states may have no regulations at all against owning primates. However, it's best to check with state authorities before signing up for chimp ownership. 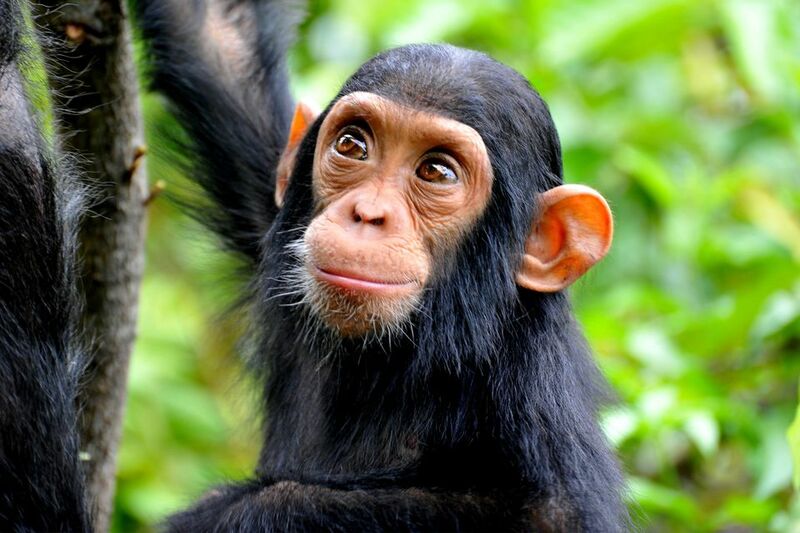 Since most states ban chimpanzees as pets and most advocacy groups lobby strongly against the trade, it is very difficult to purchase a pet chimp. So if you have a love for this animal, why not adopt one instead? Save the Chimps provides lifelong sanctuaries for chimps rescued from research laboratories. By participating in this virtual adoption service, you contribute to the care of one animal while bolstering a nonprofit dedicated to preserving the species. Before you take on a pet chimp, it's important to give the issue serious thought. Ask yourself about how committed you are to a chimpanzee as your next pet. Would a chimp truly be able to have a happy, long, and normal primate life in my home? Will I be able to afford to care for a pet that will live almost as long as I do? And how will I keep my chimp safe from the public and vice versa? These questions only brush the surface of what it means to be the owner of a large primate. Really, chimpanzees do not make good pets and there are many current owners that can attest to this. Do your research and talk to caretakers and zookeepers. Then, ponder your findings seriously before signing up. Unfortunately, many chimps end up in sanctuaries because their owner cannot control or properly care for them. In the past, chimps were trained as service animals to help their owners do everyday tasks like cook food, open doors, pick up items, and dial 911. Some people even trained their chimps to dress themselves, watch television, and play with toys meant for human children. Chimpanzees can be toilet trained, also, but many owners still keep them in diapers. And surprisingly, they can also be taught how to eat with a fork and knife, pick up toys, and perform feats similar to those of a young kid. Should a Monkey Be Kept as a Pet?